A large group of over 70 people — including Saltus students, their family members and Saltus staff — turned out on Saturday, 25th April, to clean up John Smith’s Bay as part of Keep Bermuda Beautiful’s “Adopt-A-Spot” initiative. 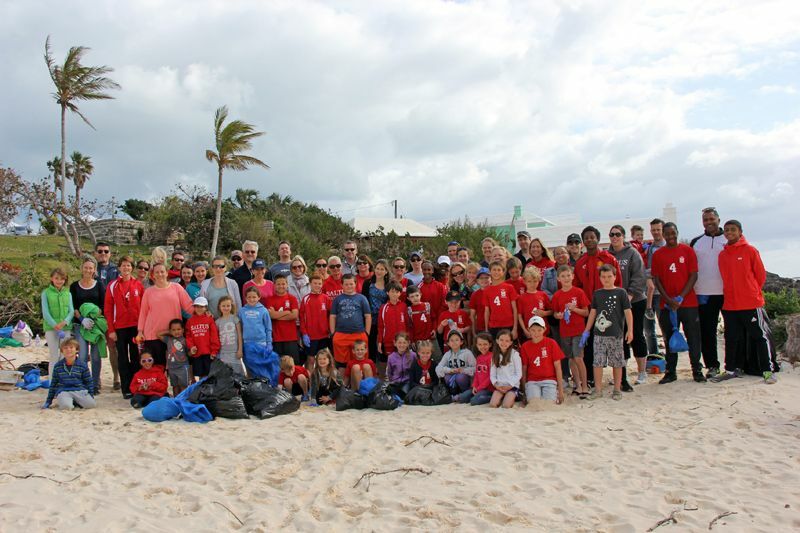 This is the second year – and the second time this school year – that Saltus students with their families and Saltus staff have cleaned up John Smith’s Bay. At the KBB AGM and Appreciation Awards Ceremony at the end of February, Saltus was awarded a certificate for “2014 Best Adopt-A-Spot Team” for the John Smith’s Bay clean-ups. It would be great if the courts were to sentence people to do something like this as oppose to sending them to prison at the publics expense,(them who can’t pay fines)Have them meet on a particular day and locations each week to help clean up the surroundings e.g. trail-way, beaches or public roads of bottles etc. Community service work like this should be the norm for non payment of fines. Well done to everyone involved. A wonderful way to show we can care for our Bermuda.